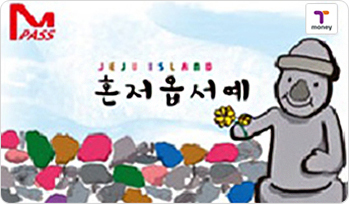 Metropolitan Pass, or MPASS, is a transportation card exclusively for international tourists traveling in the Seoul metropolitan area and Jeju. The pass offers 20 rides a day for the duration of the pass. Additional funds can be loaded to MPASS and be used as a Tmoney card. * Please note that MPASS cannot be used to pay for taxis and may not be accepted at convenience stores. MPASS comes in five different durations: 1-day, 2-day, 3-day, 5-day, and 7-day passes. MPASS will be registered as day one upon its first use and will be valid until midnight of the last day. MPASS can be purchased with Korean won only. Travelers can purchase or receive card refunds from the areas listed below. Refund applies to the card fee and remaining balance loaded in the card; 500 won will be charged for refund service. * MPASS prices include a 5,000 won deposit. When the card is returned, users will receive a 4,500 won refund. * Refunds at the airport can only be made at the Tourist Information Center. 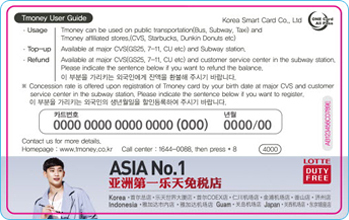 Amazing Pay Tmoney card is available to international visitors taking airport buses from Incheon International Airport. The card works just like a regular Tmoney card, with the added benefit of offering a discount of 10% off on most bus routes that connect Seoul and Incheon. In addition, the card has the same benefits of a regular Tmoney card, offering transfer discounts when taking public transportations. It can also be used as a method of payment at affiliated convenience stores. With Amazing Pay Tmoney card, travelers can receive discount benefits at restaurants, cultural performances, and even at Seoul’s major attractions, including Lotte World and 63 Square. A coupon book will be issued with the purchase of an Amazing Pay Tmoney card. 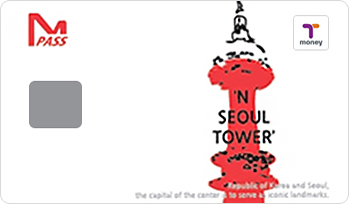 * Travelers can receive a refund for any remaining balance loaded in the card with a service charge of 500 won. Travelers are advised to load their card in small amounts as refund process for over 50,000 won can be complicated and time-consuming. 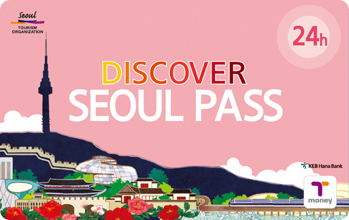 Discover Seoul Pass is a card that functions as a Tmoney card and a free admission pass to major tourist attractions in Seoul. The card comes in three types, ranging from 24-hours to 72-hours, allowing travelers to freely choose and use the card according to their itinerary. Discount benefits for watching cultural performances and shopping at duty free shops are also available. In addition, users can load the card to use as a Tmoney card for public transportation. 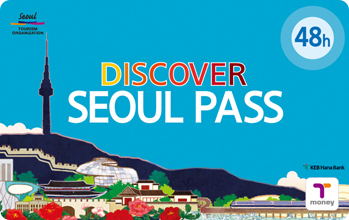 Travelers can check the card's remaining hours and affiliated attractions by using the Discover Seoul Pass app. The app also allows for use as a mobile pass! Travelers can conveniently purchase the pass through their phone to use right away. Additional benefits include 24-hours use of the Seoul city's public bicycles, a one-way ride on the Airport Express Train from Incheon to Seoul, and one free ride on a Seoul City Tour. * Hardcopy card users can only use the app to check the remaining time and information about tourist attractions. * Same rates apply when purchasing as a mobile pass. * Refund available with a service charge of 500 won. Travelers are advised to load their card in small amounts as refund process for over 50,000 won can be complicated and time-consuming. This page was last updated on November 30, 2018, and therefore information may differ from what is presented here.